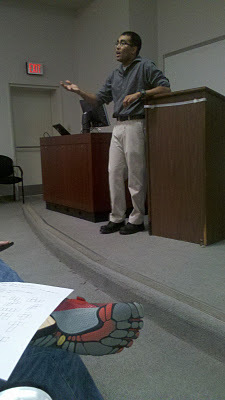 I had the great pleasure of hearing Hemant speak this weekend, the Pastafarians of USC brought him in to talk about, strangely enough, math. It turns out that Hemant has some sort of day job that doesn’t have anything to do with being an atheist. How is this relevant to a secular group? Well, I will tell you. He gave a talk about how, while atheists tend to be very alert about bad thinking trying to take over science or history education, we were less aware that there was a lot of bad thinking in teaching math. I was surprised myself, perhaps because it just never occured to me. I started college as a math major with the intention of getting a BS/MS in 5 years. And I ended up in Film, so, whatever that’s worth. Hemant made some points about how math is taught, which is that teachers give kids formulas without explaining how they got to those formulas. See, to me, as a very lazy person, I only ever remembered like 3 formulas and then figured everything else out based on those formulas. Apparently, that’s actually the better way to learn math because you understand how it works, not just that this formula does this. I admit that I was being a total teacher’s pet and I knew the answers to everything. I tried to resist, I swear I did, but it was math and I like it! 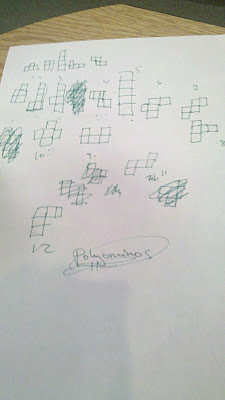 We talked about polyominoes, which is like dominos and tetris — you have to put a square next to another square. I’ll put a picture. We got assigned a task to determine how many different shapes you can make with 5 blocks and draw them all. I won a free copy of his book, because I am super awesome. We also learned statistics from World Series of Poker, that standardized tests only test how well you take standardized tests, math teachers aren’t taught to think or teach critically. Hemant gave some cool examples of practical things he did in the classroom to teach different concepts — my favorite was memorizing the names of angles in parallel lines and transversals by having kids play DDR and jump into the correct position based on the names given. It all boils down to math is awesome, math should be more about open-ended questions and applying critical thinking, and teaching math should be engaging not boring.